The cold, snowy weather isn’t going to get us down this week, because it’s almost Easter! Chocolate eggs, hatching chicks and a four day weekend…what’s not to love!? And, speaking of chocolate, we have a couple of cracking competitions this week, with tasty prizes on offer. Read on for how to enter. Having an Easter egg hunt? Share the fun and post a picture on our Facebook page and we’ll send the favourite something special! From everyone at Omlet HQ, have a very happy Easter! The jet-stream is back and instead of a sunny springtime our weather has turned somewhat siberian. It’s a good job we’ve just brought out a brand new product designed to battle the gale force winds then. Designed by our chicken experts, the new Wind Break Kits give hens protection from wind and rain while free-ranging. They can be used in conjunction with Omlet Chicken Fencing to provide a sheltered area to huddle in, similar to the wind breaks you see on the beach. Simply attach to the fencing poles using the bungee hooks provided, positioning it along one side or around a corner, as you wish. Don’t have any Chicken Fencing? These kits can also be used as stand-alone Wind Breaks. You will just need three Fencing Poles, available on our website. Made from the same material as the Eglu Covers, these Wind Breaks are available in a Heavy Duty or Clear finish, both of which will be hard-wearing and keep wind, rain and hail at bay. 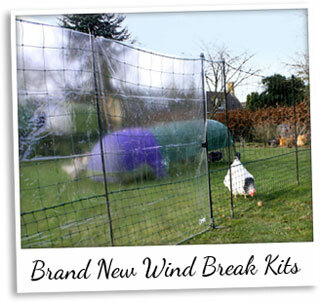 With no sign of the weather improving, buy your Clear or Heavy Duty Wind Break Kit today for £14.99! It’s not just our Eglus that everyone has been talking about recently…our egg cups and eggcessories have been spotted around the place too. The Daily Mail picked up on the cool, retro Scooter Egg Cups earlier this month, and they have been zooming out the door ever since. Grab yours today for some breakfast fuelled fun! An online Easter gift guide from Iconic Gifts also featured these little beauties, as well as the Egg Ramp, Egg Stand and several other egg cups. They said this about our range of homeware: “These really are fabulous products that children and adults alike will be sure to adore!” Read the full guide here. The Rainbow Tower Porcelain Egg Cup Set was the eggcessory of choice for In the Lady Garden’s Fads and Finds Easter Special. Sally Hudson loves the fact that it stacks vertically, saying that it is “perfect for a tidy cupboard”. Time for a Spring Clean? Click here to get yours! 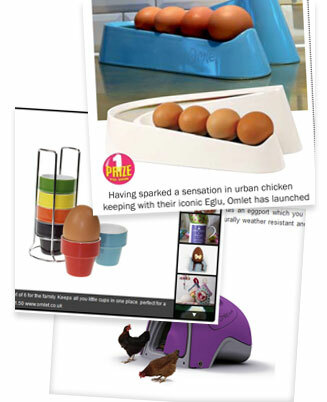 Our selection of egg cups and egg storage is meggnificent, so why not check it out today! ?